Are you singing Aretha's song right now? 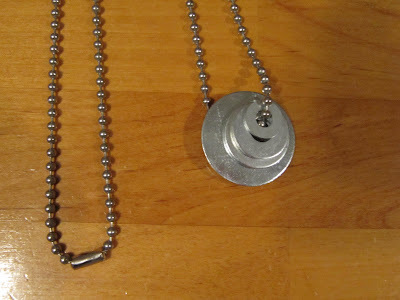 Do you know you can buy stylish jewelry from the hardware store? Well, check out the chain section. 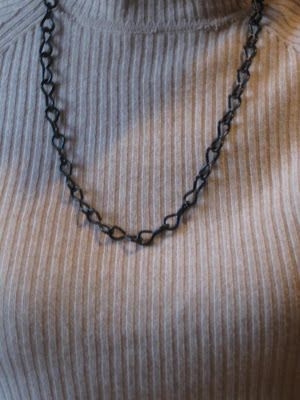 This first necklace is made with beaded chain at $1.49 per foot. I purchased 3 feet for a total of $4.47 plus 19 cents for that little doo hickey that you pinch the beads in to attach them together. The decorative parts are some of the washers from this post. The washers are decorative and handy if you're sewing with them. You can also hang a pair of little scissors when you're hand sewing. This next set is a necklace and bracelet. 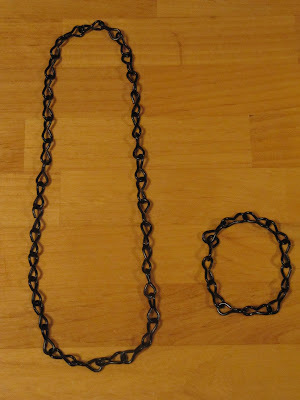 The black chain is only 54 cents a foot and I purchased 3 feet for a total of $1.62. 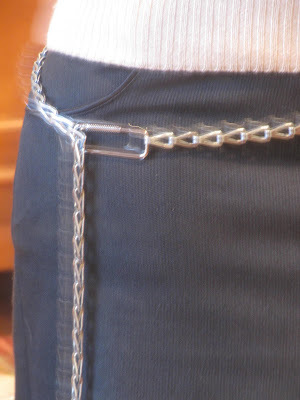 I just used pliers to open the links, measured it so it went over my head without closures and then linked it up again. 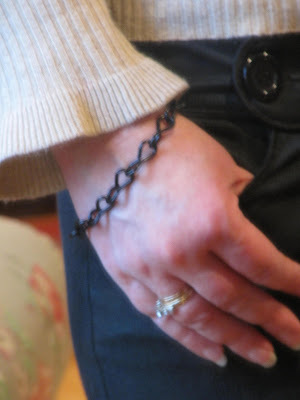 I had enough for the bracelet too. I even have some for earrings, but I need to find the wires from an old pair of earrings for that. 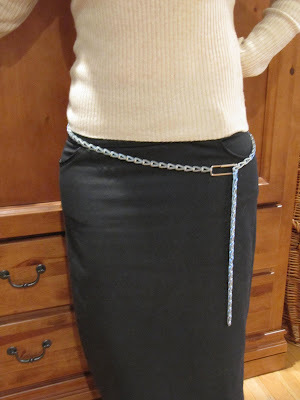 This last one is a super belt!! 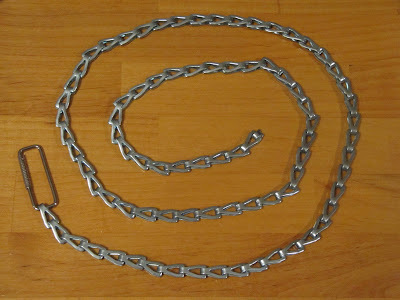 I used 4 feet of chain (it's actually called "sash" chain...I think they are finding us out again. Maybe I need to wear a mustache and a disguise when shopping in Home Depot!!) This was 84 cents a foot and the belt took 4 feet for a total of $3.36. The rectangle is a slide pull key ring I used for the closure. Nothing to do for this one...just slip it on and hook it up. Here's a little "keeping it real" picture...dog fur next to the chain that's hanging down. Why do yellow labs shed in the middle of the winter. I can make another dog with the hair that she loses. We bought stock in lint rollers!! I want to thank Kelsie for taking most of the pictures of me. Here is an example of the one I took of myself in a mirror. Looks like I was drinking!! Here's a close-up of the key chain closure. That's all for now...so go on out there and shop in the chain section of your local hardware store. People will never know where you purchased it and more importantly they'll never know how much you paid. How cleaver you are. We can all save alot of money this way. Who would have thunk it? Only you!!! It really does look awesome!! Great Karen! Now I have to have time to poke around in the plumbing aisle AND the chain section! Just another reason to hang out at Home Depot! Such great ideas - I would love to run into you at a Home Depot! Wow, Karen. This is pretty amazing. No one would EVER know this was all from the hardware store. Perhaps you should have kept this secret to yourself... you could have make a killing on Etsy! 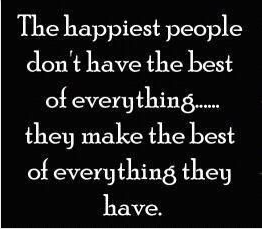 But thanks for sharing the wealth. 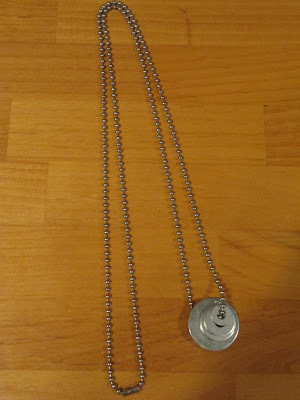 Love the chain with the washers!!! 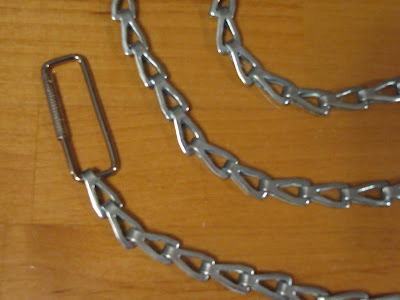 Many teens sport chains...if they only knew how much they would save in the hardware store! Hee!! One person shouldn't be allowed to be that creative!!! Thanks for the great ideas. I went to Home Depot today with a whole new outlook!! I love it Karen. 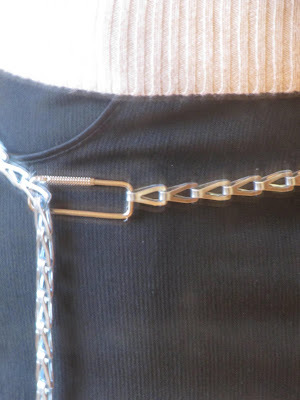 Who would have thought that chains like that could be so stylish. Super cute and very clever...who knew? 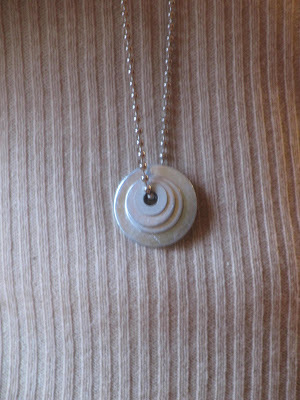 Love the first necklace with the washers. So fun!! You are really unbelievable, do you know! Just love it! Watch out Home Depot because here I come! I can't believe that you made all of that for less that $10.00....awesome! Look at all the different things you made. So cool! I think my favorite is the bracelet or the belt! 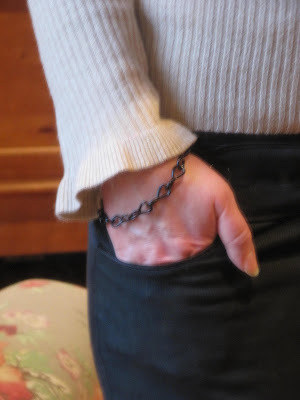 Ranger Inks will change the colour of any of those chains, so any outfit can have matching chains....I use a beaded one for my little clover thread cutter. Beautiful jewelry! Great work! 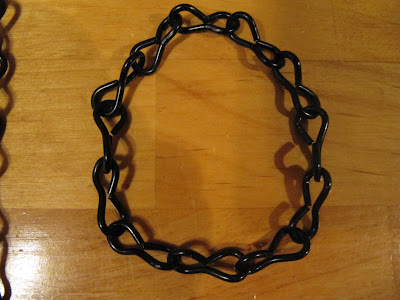 Get the jewelry making supplies, jewelry making tools and jewelry making deals that you crave! Create the ultimate treasure trove of jewelry making supplies here and be prepared for any of the WigJig jewelry making designs that catch your eye.